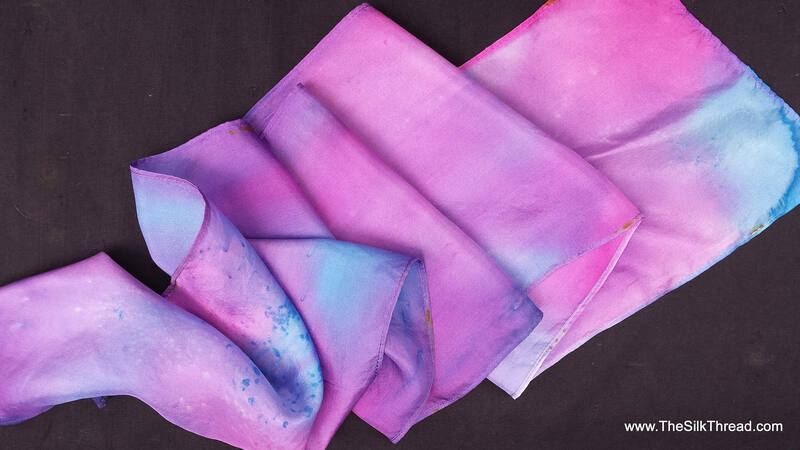 This beautiful hand dyed silk scarf is a lovely combination of soft blues, purples and magenta intermixed into the silk. A perfect 8" x 54" size it would complement anything from casual to dressy. In all my silk pieces, I either design and carve my own reliefs, build the blocks and print my designs with textile inks to imprint the design onto the silk or hand draw all my designs onto the silk. The results are classic designs, beautiful colors and a one of a kind silk scarf. This is pure silk fabric with a lovely shine. Each piece is hand painted and dyed by artist M Theresa Brown. Everything hand done here in my North Carolina studio. You will find no digitally printed scarves here! Hand wash in cool water, drip dry. Iron as needed.